I got the blurry print from last week reprinted. So much better now. I asked Master B and Master W if they would draw me something for the album. I ended up getting 2 pictures of the same thing. So very cute! I am loving all the photos of our reality- 4 of us at the table all doing something different at the same time. Love that we can all be together in the afternoons. I am trying to make sure I get a photo with each of the boys in the week. Loving Master B's serious look he's rocking. My package arrived from Anne in Michigan. Here is what I have sent to Anne. I really like my new dishcloths. The chocolate may have already been devoured (yum). Thanks Kimberley for such a cool dishcloth swap! I do love a good dishcloth swap. All our dishcloths we use are either knitted or crocheted. My swap Partner is Anne from Michigan, USA. As far as I know she doesn't have a blog. I crocheted something I enjoy making that's simple and I like to use at home. I have included EcoStore Soap (my favourite) and a nail brush and couldn't resist putting in a few New Zealand confectionery favourites for Anne. 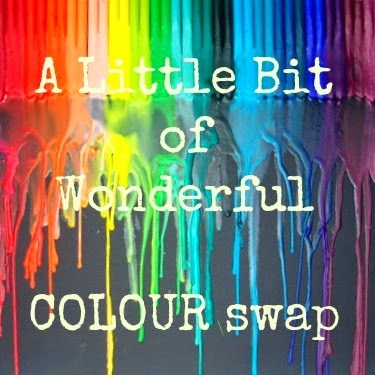 The lovely Miriam has organised a little bit of wonderful colour swap. The person I got was Leonie. I was emailed a list of her likes and dislikes so that helped me decide what to send. So long story short (for my lack of instruction reading ability) I am sending a wonderful parcel that is basically the rainbow- that just happens to be individually wrapped up. Happy Swapping everyone. I will do another post once I know it has arrived. Don't want any peeking! ......stalled- but is 95% complete. I may have forgotten to order 12 pieces- Opps! But good news I do really like this chess set. The boys were insistent on helping. They enjoyed building the base. I choose to make it smooth so each chess piece wouldn't break when you had to take it off the base plate. Now I need to figure out how to store this chess set. Feeling really organised for Mr B's birthday! The lovely Lauren hosted a clothes swap. The main idea is you bring along 5 items of clothing you no longer wear/ want to swap for free. This was my pile of items no longer needed. A few tops, shorts, skirts, bracelets and scarves. It was exciting to arrive and see 2 tables piled up with clothes. The greatest part was finding clothing that fitted and that we would be happy to buy in a shop. We had plenty of time to put items aside, try them on, show others and decide what we want. Most of us went back through the piles again and were pleasantly surprised to find things we didn't see the first time. I was so stoked to find a pair of boots, open toe shoes, a jacket, a tee shirt, 2 pairs of jeans and 2 dresses. Clothing swap win!! So much fun with friends and it cost nothing for a super fun morning and of course who doesn't love the thrill of finding new clothes.